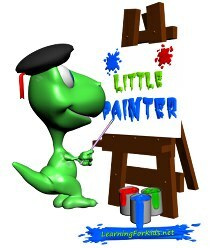 Here we launch our little surprise, it's a sensational painting program for children called Little Painter. The program has been created to help parents who are bringing up children who are fond of painting. The children have a friendly and easy-to-use graphical program with colorful and pretty graphics. The program has a built-in number of tools, such as; special effects, stamps, magnifying glass and the ability to transform any image into a coloring book. Additionally, you can take advantage of other images, brushes, stamps and coloring available with the built-in browser in the program. The program can handle read and write in the most popular image formats: bmp, jpg, png and gif. Thank you very much for using our projects and we welcome you also to like our fanpage on FaceBook.